Who said salads are boring? 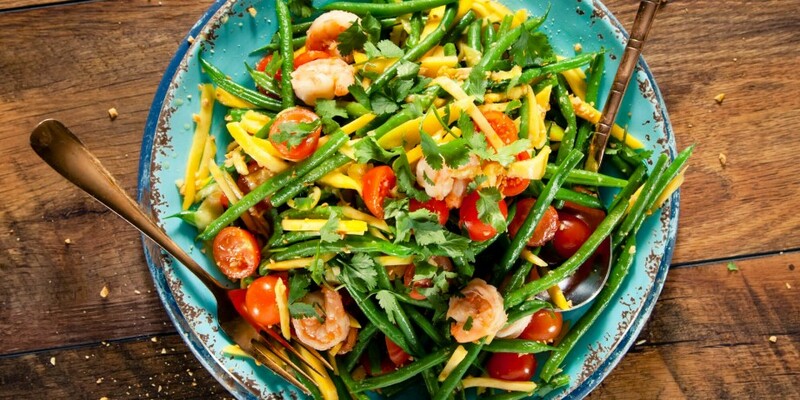 With exotic ingredients like papaya, Thai basil and ginger, a salad can be both inspiring and delicious! Explore our twists on this summery staple and discover a refreshing mix of flavours that take salad to a new level. We’ve put together three of our summer salad favourites packed with vibrant flavour. Pick up an unripe papaya! Believe it or not this gem of a fruit has cucumber-like flavour and crunch. Dressed with garlic, chilli and peanut, this simple ingredient can transform your salads. Bulk it up with some sticky rice and you have a classic street food staple straight from the streets of Bangkok. Transform a midweek favourite – mince - with our recipe for Laab, the unofficial national dish of Laos. It’s packed with chilli and Thai basil for a spicy, liquorice-like kick. Wrap the tasty meat mix in gem lettuce and enjoy a fragrant and filling dish straight from the busy street stalls of Vientiane! Rustle up a quick and tasty Asian Salad with your family’s veggie favourites straight from the fridge for a tasty lunch with crunch! We’re thinking fresh cucumber, carrots and baby corn drenched in a sesame, soy, ginger and jalapeno dressing. This salad is an easy way to get more veggies into your family meals and pretty much any combo will work. Discover more salad recipes on our website, then gather your friends, get the garden furniture out and explore the flavours of Asia with our fresh salad recipes. Find us on Instagram and share your Asian flavour creations with us @bluedragonuk!